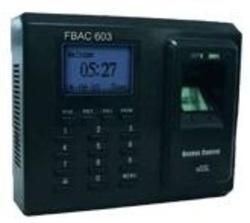 FBAC 603 (F702) is a standalone fingerprint T&A + Access Control system System, IN and OUT status, also low price with good performance, designed specially in the purpose of popularizing the fingerprint products. It could store 1500 fingerprint templates and 50000 transaction records. It will bring you much profits because of its low price. Terabyte Security Solutions is a leading Security Surveillance solutions company. Part of Terabyte Group, serving the industry since last 10years.Our team of staff are qualified, respectable, friendly and professional and will find a solution to meet your needs.TeraByte Security Solutions offer a comprehensive range of security solutions. With a reputation for accommodating a variety of budgets, whilst maintaining quality workmanship at all times, Terabyte Security Solutions has built up an impressive reputation.We are also an authorised distributor for Geovision Security products for Maharashtra, India.Our Core Technical Team Consists Of 5 Specialist.Our mission is to create value and provide consistent satisfaction to our customers. by delivering innovative products and solutions and by completely supporting what we deliver.